Where Did My Family Get Their Meat Over 100 Years Ago? Answer to my title question: the townfolk got their meat from a butcher! Occasionally, in my collection, I find a photograph of someone who isn’t family. Quite some time ago, I posted a photograph my family saved of the local saloon keeper, the famous Dutch Arnold. I’m pretty sure there is a story there that didn’t get passed on–at least not to me. I also have a photograph of the local butcher, Tom Richmond, and his family. Apparently, he had a slaughterhouse and butcher shop close to where my relatives lived. Grandpa told me it was on Balch Street. But maybe it was just close to Balch Street. I did find one of Tom’s ads in the Kalamazoo Gazette. It appeared April 9, 1898. Notice that this ad gives a North Burdick address. My relatives’ homes and businesses were mainly congregated near the intersection of Burdick and Balch in Kalamazoo. Maybe as a small boy, Grandpa thought the shop was on Balch, but it was on Burdick. Or maybe he remembered incorrectly (unlikely–his memory was amazing). Or maybe the shop moved. Someday when I have all the time in the world ;), I’ll try to put together a map of the area with my relatives’ homes and businesses, as well as the surrounding ones. Create a little village on paper, in a way. At that point, I’ll have to use the City Directories to figure out precisely where Tom Richmond’s butcher shop was. What makes it hard, though, is that the address numbers have been changed since that time. This is what I don’t really understand: what kind of custom would be responsible for my family winding up with portraits of neighbors, friends, or merchants they frequented? I am entertaining the thought that maybe somebody’s somebody married into this family. I’ll have to keep searching. 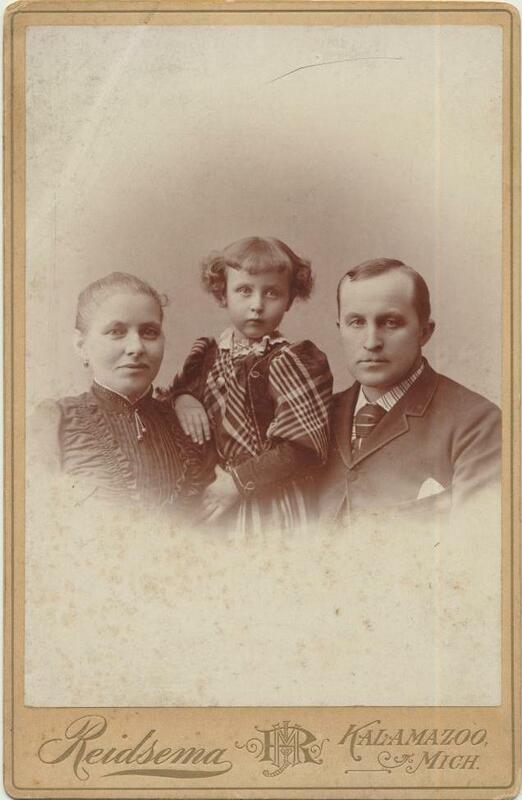 If your family has old photographs, do they have portraits of non-family in the collection? The photo and ad raise a lot of questions. Good luck finding the answers and making your map. Doesn’t that sound fun? A model of the area would be even better! Mary, are the photos identified? Are there formal portraits of non family members? I can’t figure out how friends would get expensive family portraits! I’ll only be able to answer that question when I finally name all my “unknown” photos! 🙂 Love reading your blog. Hah, good luck with that project! Your blog looks great! Thanks for stopping by! Kathryn, are any of them formal portraits? I’m so curious if it was common for friends to exchange formal photos. The poses are formal, but the stock the pictures are on are different. Some are on the heavy stock and others are postcards. Another item to research on the ole list: prices of photos in those days relative to income. I have lots of photos of non-relatives but none of them are professional shots like this. They are all snapshots my great grandmother took and they are of close friends from their pinochle club that my grandma has been able to identify. From my experience it seems unusual that your family photo collection would include a professional family portrait of the butcher’s family. Curious! If you figure it out, tell us. Those must be exciting for showing personality etc! As far as formal portraits that is what I was wondering! None of those in my collection. Hahahaha! There IS. That kind of situation!!! I have a lot of unidentified photos from the late 1800s and early 1900s. Some of the few that are identified have the names of very, very distant relatives on them. I think that they may have been given as small Christmas gifts to a great aunt. I’m glad a few are identified, but so sorry there are so many that are completely unidentified. Don’t give up hope though. More information comes to me all the time. Interesting that those are such distant relatives. Where they distant then or are they just distant these generations removed? I have a lot of items that originally belonged to several relatives who never had children. I think that they were very interested in staying in close touch with their siblings’ children and grandchildren–thus all the photos. Ah, so you are the repository for the family history! Luanne, Perhaps the photos were given as gifts to family friends? it’s quite possible your family and the Richmond family were very close. The portraits could have been holiday gifts. I have about 300 photos from my late maternal Grandmother. I’m just starting to sort them by year and family. With a few exceptions all casual and formal photos are immediate or extended family members. My Grandmother was meticulous about putting a year and name on almost all of them. My problem isn’t identifying the photos it’s getting them into digital form in a way that will improve the condition they are currently in. Issues like clarity, touching up, sizing and so on are going to pose many challenges for me.